Mahler's sixth symphony is a piece that seems confused by its own character, considering the ambiguity with which it both navigates conventional symphonic form and smears the expectations and limitations of late-Romantic musical style. 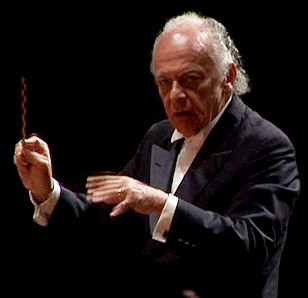 It is also a colossal piece, if less in length (though its 80 minutes - or thereabouts - is of course substantial enough) than in emotion and depth of thought, and as such Lorin Maazel and the Philharmonia's decision here to dedicate a whole concert to it and only it proved a winning one. Given as the third concert in a cycle of Mahler symphonies that is shaping up to be one of the events of the concert season in London - judging by the packed crowd and the high level of musical achievement - this was a devastating presentation that teetered (engagingly) on the brink of intelligibility at times, and soared to the heavens at others. It was also rarely a safe performance, despite the seemingly moderate choice of tempi; fidelity of excavation of both the glistening sonic detail and the mysterious musical argument were privileged over accuracy of pacing or the polishing of Mahler's rough edges. Thus each plane of material in the first movement - and the spatial metaphor is a good one, considering the visual way we consume live music - felt mined from rock; tough and resilient but novel as a fresh discovery at the same time. The repeated bass notes grunted along whilst higher strings and drums immediately and from then on engaged in high emotion. Maazel achieves a much more engulfing sound in this movement than someone like Gergiev (though Maazel lacks some of the latter's punch and force), chiefly, I would say, through his choice of tempi (slower, though not funereal) and his greater sense of ensemble warmth, even in a music as full of dread as this. Alma's theme, at each recurrence, benefited enormously from this warmth. The development section was perhaps the highlight, though, despite the richness of the exposition, as it was here that the sheer diffracting ideal of this performance came to the fore; offstage bells and cowbells threatened to bring pure chaos to the sound field, whilst Maazel and the orchestra studiously and passionately worked their way to the overwhelming end. Lower brass, incidentally, should be commended for the particular vigour - not at the cost of accuracy - of their playing in this movement. The ordering of the second and third movements in the symphony has been a matter of some dispute, of course. On this occasion Maazel placed the Scherzo second, thus running the risk, due to its broad similarity (even parodic similarity) to the first movement, of arresting the momentum of the performance. But it is the case that we were allowed to hear the first with such fresh ears here that, for its brutish material to be raked over again from a different angle immediately in the second movement, felt just right on this occasion, lending the progression a fascinating sense of internal coherence. And, of course, in this format the profundity of the Andante shines only brighter, appearing out of the tumult of the preceding movements with a sort of ambivalent serenity that is quite exclusive to this composer. The opening of the finale is one of the most bizarre passages in all of Mahler. It seems, in its winking, blinking fragments of gestures, and its ruthless and oud-like harp descents, to call forward to Webern and to Kurtag, whilst reserving at the same time an enigmatic (particularly in Maazel's thoughtful, highly attentive hands) profile all of its own. As the movement proper gets going you never leave behind the uncanny feel of its opening, and as such the famous hammer blows, following elongated arguments for and against resolution, bring a kind of terrible declaration that only resolves into a form of peace right at the end, in Maazel's ushering to silence of a glistening minor chord. This was a performance that felt as big and as confused and as full of the differing forces of our world as Mahler‘s sixth symphony itself does. Of particular moment here, it seems to me - in addition of course to the strong and cohesive, even in mystery, playing of an orchestra which, due to an errant Jubilee Line, was without its leader for the first movement - was Maazel’s complete giving over of himself to the fervour of the music, such that every thunderous timpani roll and hefty hammer blow of the finale, like every graceful leap into Alma’s theme in the first movement or tinkle of volatility in the introduction to the finale, seemed to issue chiefly from the sweaty brow of the conductor himself, or, if this is too antiquated an interpretation, at least to channel through him before exploding out as beautiful, moving, shocking music in the hands and mouths of the orchestra. Wonderful.